Creative food presented in an intimate setting in southeast Portland. Breakfast & Lunch daily, Dinner Sun. 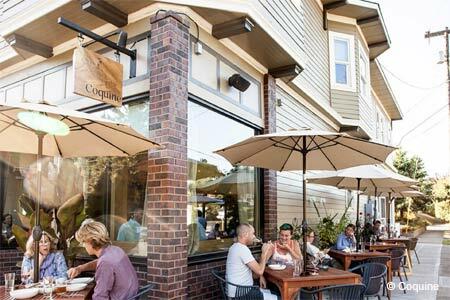 : Coquine is a cozy restaurant located in a residential neighborhood next to Mount Tabor Park. Chef Katy Millard manages to effectively straddle fine dining and home-style cooking with a limited, daily changing menu that emphasizes local and seasonal foods, turning comfort dishes on their heads by adding unusual flavors to intrigue the palate. Select a chef's choice prix-fixe dinner with optional wine pairings (requires participation by the entire table) or order à la carte. Choices may include brioche shrimp toast or tempura asparagus as starters, and entrées such as strozzapreti with rapini, Calabrian chili, fresh sheep's milk cheese, green garlic, brown butter and lemon bread crumbs, or a delectable halibut with morels, Tokyo turnips, scallions and licorice. Share a roasted whole organic chicken enlivened by wild rice, roasted maitake mushrooms, rosemary and preserved cherry blossoms. Dark chocolate cake with a chocolate cinnamon ganache and horchata sorbet makes a first-rate dessert. Expect a carefully curated wine list and clever cocktails. Breakfast and lunch bring simpler dishes but all are well done, including homemade pastries and Stumptown coffee in the morning, and for the latter a choice of salads and sandwiches. A lovely outdoor patio is available for summer dining. Service is attentive and professional.